Martina from Adventures in Children’s Publishing and author Lisa Gail Green are hosting a March online workshop on the first five pages. I was lucky enough to be one of only five entrants. Last Saturday our first five pages were posted for critique. We then spent last week revising. The revisions for four of us are posted now. Feel free to check out my entry and leave a comment. While there, you can visit the other entries by looking in the right-hand navigation panel for links to the other three (mine is #1). Thanks so much to Martina and Lisa, and everyone who commented, for their help! On a different note, below are two of the three different pairs of mitts I crocheted myself this winter to keep my hands warm while I write. 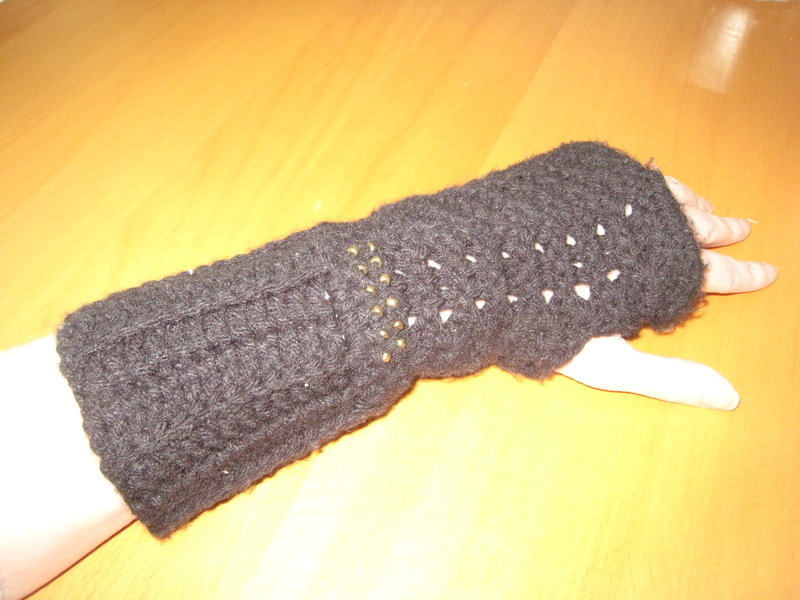 I also made a pair in brown and I started a pair in navy blue that I didn’t finish. In addition to these I made a black pair for my best librarian friend, a pink pair for my best New Jersey friend, and four pairs in various colors for some of the boys in my life. For a time they were calling them ninja gloves. 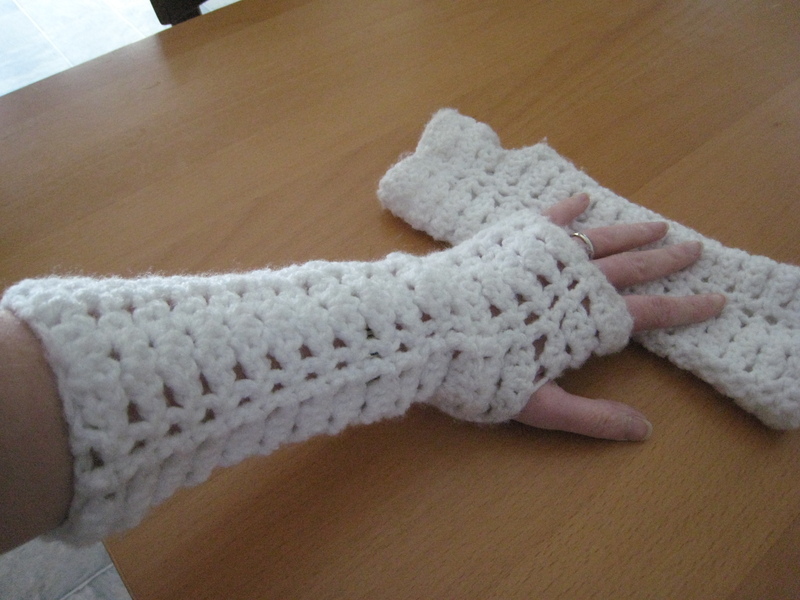 I live in the northeast and we keep our house cooler during the day to cut down on energy costs, so I absolutely need the mitts to make typing bearable in the winter. My other “trick” is to drink lots of hot tea. What do you do to get through the winter? I can’t believe you find the time to crochet too! What a gal. They are exactly what I need, my hands are frozen. It slows down the typing. Hmm, well, I can make you a pair during my next Must-Crochet phase. It hits about once a year for a few weeks, usually while I’m waiting for feedback and can handle a few hours a day off from writing. Going to check out your pages. Those mitts are super adorable! You are talented 🙂 I wish I can make those. I live at high altitude so my hot tea always cools off too rapidly to be much help to keep my hands warm!! I need to get one of the electric mug warmers. My strategy is to settle with my laptop as close the woodstove as I possibly can! Congrats on being of five picked for a five-page workover. I’d love to have Lisa give me feedback on my work! Congrats on the workshop entry! Wow, that was really nice of you to say! You have a great concept and voice, you just have to figure out the best way to tell the story. Congratulations! Off to check it out. Congrats on getting into the revision session on ACP–I’ll have to go back and read the entries! I too live in the north and it’s been a brutal winter this year. I keep sweatshirts and blankets. I’ll check out your entry when I get a chance and congrats on being one of five to make it. Anyway, nice job on yours! If I have nothing else to do I can crochet a pair in a day. Or if I get side-tracked by real life, it can take a week or more. I’m glad everyone likes my mitts. RocketMan doesn’t get it.